There are two kinds of Chicagoans. No, not North Siders and South Siders. We’re talking Giordano’s people and Lou Malnati’s people. 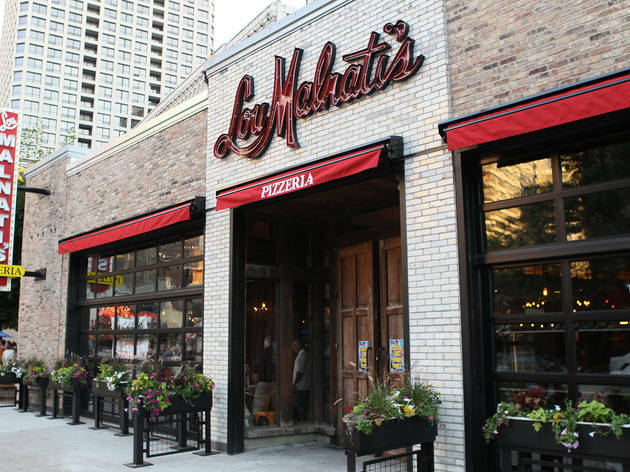 Lou Malnati’s deep-dish is the pinnacle of cheesy Chicago-style goodness. Everything else on the menu—including pastas and salads—is passable, but not worth passing on the ’za. Get the butter crust. And don’t worry when you develop a Lou Malnati’s addiction: They Fed-Ex pizza anywhere in the country. 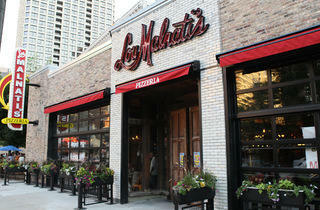 The very first Lou Malnati's opened in Lincolnwood, IL, in 1971. Today, you'll find locations scattered throughout the city and Chicago suburbs. Husband and wife team Lou and Jean Malnati have created nothing short of a pizza empire with their handmade-from-scratch pizzas, fresh mozzarella cheese and that signature crust. Lou Malnati's is a texbook example of deep dish pizza, which involves a "backwards" technique of layering ingredients. Dough is topped with slices of mozzarella, which is sprinkled with veggies and sausage. The whole thing is covered with a bath of fresh tomato sauce, tomatoes and more cheese. The thing that sets Lou's apart—and that you won't find anywhere else—is that crunchy, buttery crust. El stop: Brown, Purple (rush hrs) to Merchandise Mart. Bus: 22, 37, 65, 125, 156. This was a recommendation I gathered from Facebook friends and Lou's was the restaurant that garnered the most likes. I had the vegetarian pizza with the tomatoes and mushroom since I knew something like the sausage would be a bit heavier. The crust was yummy and crispy and complimented the insane amount of cheese and sauce that we had. the service was also great and it was just a great restaurant to relax in after a day of site-seeing. Awesome deep dish pizza and great little take aways. It can be a long wait on weekends but well worth the effort! The deep dish pizza is delicious, as is the flat crust. Just be aware at what time you go because occasionally you will have to wait a long time because they only take reservations if you have a larger party.